Quicklink launches Studio-in-a-box for remote HD productions. Swansea, UK, October 2017: Quicklink has launched its new video/audio solution that utilises the Remote Communicator product. The Remote Studio-in-a-box solution is ideal for creating full remote controllable HD studio productions. Connecting to Quicklink’s globally optimised low latency infrastructure, the Remote Studio-in-a-box delivers bi-directional video/audio between the contributor and broadcaster. The solution allows you to manage your vision, lighting and sound remotely from a secure web management portal. The Studio-in-a-box includes an inbuilt 8.4” touchscreen monitor, Panasonic pan/tilt/zoom camera and lighting. The in-built Panasonic pan/tilt/zoom camera enables you to remotely control the zoom, focus, exposure, aperture, pan and tilt. The Panasonic camera also allows you to remotely control image adjustment, enabling you to control the brightness, contrast, hue, saturation, sharpness, gamma, white balance, backlight compensation and gain of the camera. The solution also allows you to control the brightness and colour temperature of the in-built lighting along with up to 5 DMX-512 lights. Requiring only an internet connection, the Remote Studio-in-a-box is a simple one-button operation for the contributor. The Remote Studio-in-a-box is everything you need in one compact solution, including Panasonic PTZ camera, lighting, microphone, headset and carry case. 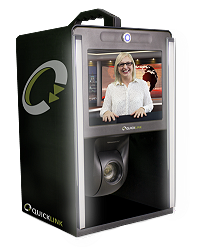 To complement the Remote Studio-in-a-box, Quicklink has also launched the Remote Studio. This solution is available as a 1U unit that allows you to remotely control HD productions using your own Panasonic PTZ camera and DMX-512 lighting.